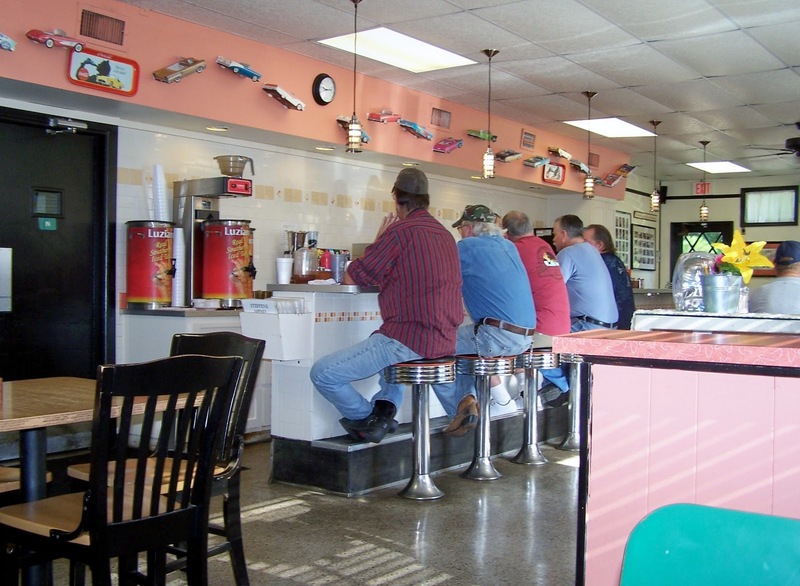 Occasionally as I drive the backwoods two-lane blacktops that criss-cross this country of ours, I’ll pass an old fashioned establishment that is just too authentic, too nostalgic, too quaint – too endangered – to pass by. 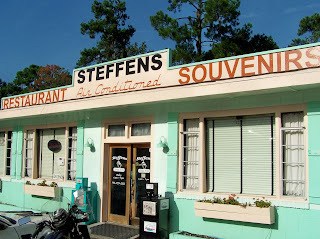 Steffen’s, out here a stone’s throw from the Okefenokee Swamp on old Highway 17 just north of the St. Mary’s River Bridge that separates Georgia from Florida, is one of those establishments. The first time I ever drove by, I immediately knew something special had to be happening in this place. The retro neon sign. The low-slung decades old building. The packed parking lot. There aren’t too many places left like this any more. Why? The answer lies just a couple miles away at the Kingsland exit off of I-95. Corporate chain restaurants, motels and fast food joints as far as the eye can see. Kingsland may still be a small sleepy Southern town, but it’s been discovered in the corporate boardrooms of every fast food conglomerate from Arby’s to Zaxby’s. Tourists speeding from the frigid northeast to sunny Florida pull off at the Kingsland exit in throngs to sleep, eat and perform necessary bodily functions. And then quickly zoom back down 95 toward the land of Mickey Mouse and Casey Anthony. 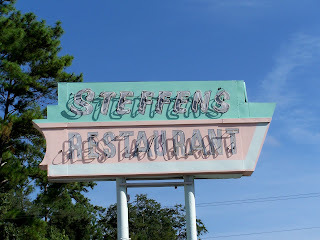 Five decades ago, Steffen’s might have been one of those places. Back before there was a 95. Back when 17 was the only way to get from Virginia to Florida. And it’s testament to the business savvy and good cooking of the folks who have kept Steffen’s open for over half a century that I can still pull into the parking lot for a home cooked Southern breakfast that wasn’t designed in a test kitchen in Chicago. Steffen’s is so local and low key, you won’t find it in any of those “Eat Your Way across the USA” type books. That annoying guy with the spiky hair on the Food Network won’t be stopping by here any time soon either. But that’s okay. 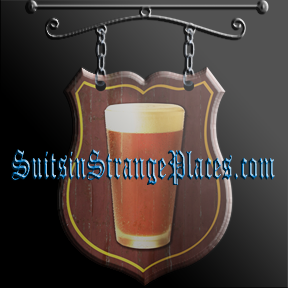 Steffen’s does plenty of business without them. 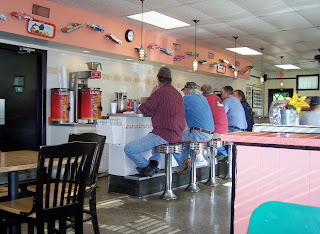 Town cops, local politicians and little league coaches all crowd into Steffen’s every morning to slap backs, yuck it up about the high school football team’s latest state championship and gossip about Mark Richt’s future as head Bulldog. But what really keeps the locals coming back is the food. 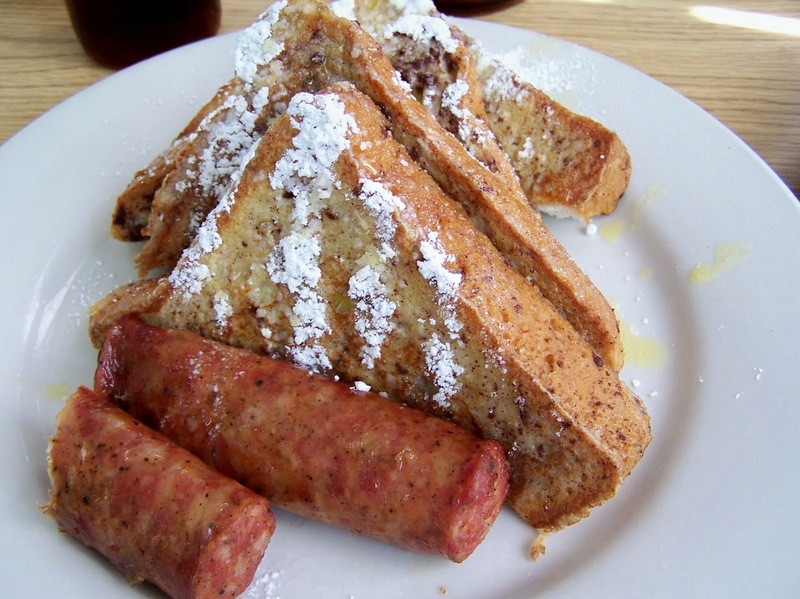 My French toast, Wainwright Sausage and biscuit and gravy were the perfect cross section of Steffen’s good country cooking. I think it’s actually illegal to come to an old fashioned Southern place like this without trying the biscuits and gravy. 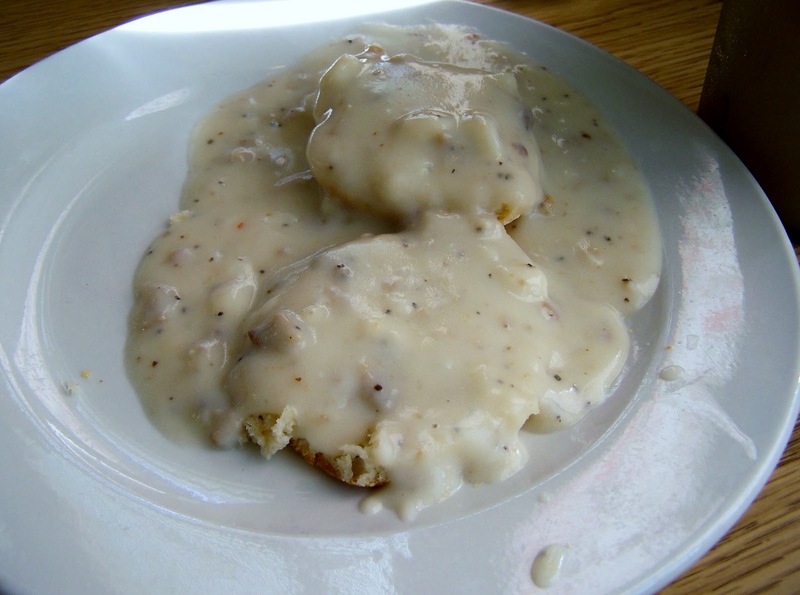 Crispy on the outside, and soft on the inside, Steffen’s biscuit held up well under the generous spread of white cream country gravy specked with sausage. The French toast consisted of four huge halves of Texas toast battered, buttered, seasoned and sprinkled with powered sugar. Best of all, it came with real sugar cane syrup made on a farm just a few miles up the road. Less sickenly sweet than the more ubiquitous maple syrup, homemade Georgia cane syrup was the perfect complement to the already plenty sweet French toast. On the side, my Wainwright Sausage, made by W. J. Wainwright and Son Meat Curing up the road a ways in Nahunta, put regular limp breakfast sausage links to shame. This is dense, smoky thick sausage that packs a porky wallop. You got to love it. Local syrup. Local sausage. Local gossip. It’s little touches like that -- homemade country cooking with local flavor that makes a place like Steffen’s always worth the effort to drive past the “golden arches” and Cracker Barrels out by the interstate.